Samsung Heavy Industries was awarded with billion dollar contract for construction of floating production unit by BP. The agreement includes building and installation of floating production facility for the Phase 2 of BP’s Mad Dog project, located on 200 nautical miles south off New Orleans, USA. The total worth of contract is 1.5 trillion KRW or 1.25 billion USD and delivery is estimated in August 2020. The offshore floating production unit will have deadweight 58,000 DWT with capacity to produce up to 110,000 gross barrels of crude oil and 0.71 million cbm of natural gas per day. 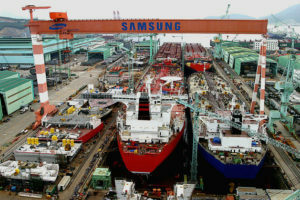 Samsung Heavy Industries received the order thanks to its technological prowess proven by its experiences to construct large-sized floating production units. The agreement in important for the finance-troubled shipbuilder, which suffers from decreasing number of orders and growing debt against low liquidity. Mad Dog field was discovered in 1998 and put in production in 2005. Currently the offshore field has production capacity of 80,000 barrels of oil and 1.70 million cbm of natural gas per day. The second phase of development started in 2009, when the field had been estimated to hold more than 4 billion barrels of oil, twice more than the initial estimation.